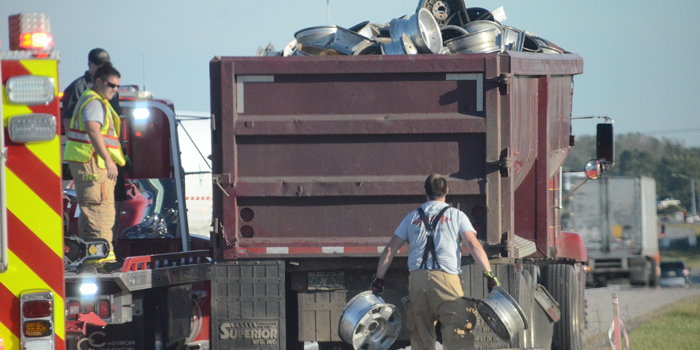 Emergency responders clean up automotive rims that spilled onto the highway following the Wednesday afternoon crash. WARSAW — First responders were called by Kosciusko County dispatchers at 5:37 p.m. on Wednesday, Sept. 26, for a personal injury accident involving a car, a motorcycle and a semi. The accident occurred in the eastbound lane of US 30, just east of Springhill Road in Warsaw. The semi tractor trailer was hauling automotive rims, which had to be cleaned up from the highway before traffic could resume.